V.S. Krishnan pays homage to the saint-composer Arunagirinathar. A FAMILY bhajan in a temple? I will begin at the beginning. We are ardent devotees of Lord Muruga. Our devotion grows only stronger every time we feel that God is putting it to test. Once, my brother-in-law left my sister, Janaki, at our home and never came back. Months turned into years. We then decided to make a desperate appeal to Muruga by way of 41-day Thiruppugazh bhajan at the Ganapathi temple. The bhajan concluded with Deeparadhana. As our eyes wandered through the vast audience, they stopped at one place or rather at one person. We could not believe our eyes! There, at a corner, was sitting the very person whose homecoming was the prime object of this bhajan. Later, we flooded him with queries, and he said: "I was looking for a job, and for various reasons, could not come or write. As I came here to take Janaki to Madras, I found the house locked. Your neighbour guided me to this temple and here I am." May be it was a coincidence. But we believed it was our faith on Lord Muruga reinforced by our faith on Thiruppugazh that performed this miracle. Even while remaining in Kerala, we were fortunate enough to get introduced to Thiruppugazh form of worship, thanks to our Guruji, Sri Mani Iyer, who visited us whenever he came to Palani. We believed, when we prayed through Thiruppagazh, Lord Muruga readily answered because it was the Lord Himself who helped the author in composing it. The person fortunate enough to have got the divine blessing to compose the hymns was Arunagirinathar. Born in the holy town of Tiruvannamalai, around the 15th century, he derived his name from Sri Arunachaleswarar. Very little documentary evidence is available about his early life and whatever details known were collected from hearsay. He lost his parents at an early age and was brought up by his sister. He was highly proficient in Tamil and Sanskrit. Driven by an urge for carnal pleasures, he led a life of sin. At one point of time, he realised his mistake and decided to end his life by falling from the temple tower of Tiruvannamalai. Suddenly, out of nowhere, someone appeared and rescued him. "How can you end your life so abruptly when you have been assigned an important work of God," the saviour said. `Thiruppugazh', as your songs will be known, will be the Mantra to save the lives of many more. Go and compose songs studded with pearls (muttu) of devotion and wisdom." Arunagirinathar felt he heard the divine command of Lord Muruga conveyed through this person. Within minutes he realised, he had been transformed into a new person and composed his first song: "Muttai tharu pathi thiru nagai..."
That poet never stumbled. Songs flowed like a perennial river in full spate. Having got a new direction, Arunagirinathar set out on his holy mission. He traveled the length and breadth of Tamil Nadu, beginning from Vayalur. He visited the six most sacred abodes of Lord Muruga, Tirupparankundram, Tiruchendur, Palani, Swamimalai, Tiruttani, Pazhamudhir Cholai, and all 216 holy shrines of Muruga, Siva and other deities, composing song on the significance of each. He is believed to have composed over 16,000 songs covering all aspects of life but only 1,365 songs have so far been traced. The Lord of Swamimalai, (Gnana Pandithar) who is the fountainhead of all knowledge, appeared to have showered His blessings profusely on Arunagirinathar. Thiruppugazh is a set of songs that kindles the music of devotion in one's heart and stimulates spiritual awakening in the mind. It is an invaluable treasure; a seeker of salvation can draw inspiration from. Apart from songs on Muruga, Thiruppugazh deals with 64 episodes of Lord Siva (Thiruvilayadalgal) and the power of Sakti (Parvati). References have also been made on the Ramayana and the Bhagavatam. While the first half of all songs deal with the various ills plaguing mankind, the second speaks of the mercy of the Lord, imploring Him to provide the much needed healing touch. It is also believed that Thiruppugazh reflects the message of the Vedas and the Upanishads. The song, "Naveru Pamanatha" says that by adhering to the 28 tenets (agamas) contained in the four Vedas, one attains a stage where his identity as an individual merges with God. The eternal wisdom contained in the Vedas and Upanishads is expressed in an understandable and musical way in Thiruppugazh so that everyone could reap the rich fruits of knowledge available from it. Arunagirinathar is the author of Kandar Alangaram, Kandar Anubhooti, Kandhar Andhathi, Viruthams on Vel and Mayil. Through Kandar Alangaram, the saint offered his favourite deity, not a garland of flowers (poomalai), but a garland of songs (paamalai). It describes the different manifestations of Muruga in each temple and how He showers mercy on the devotees. In Kandar Anuboothi, which is a subjective narration, the author spells out his own divine experience of how the Lord extended His helping hand. Vel, the weapon of Muruga, represents the sharpness of intellect. Known as Gnana Vel, it is believed to radiate the light of knowledge. Peacock is the vehicle (vahana) that adds lustre and colour to His overall appearance. Kandhar Andhathi is a hymn consisting of 100 stanzas of four lines each, the first word of all four lines starting with the same word yet each carrying a different meaning. As Arjuna is known for his talent in archery, Arunagirinathar is known for his power of vocabulary (Villukku Vijayan, Vakkukku Arunagiri). The songs, formed in rhythm, are so composed that they can be set to music in different ragas. As Thiruppugazh also lends itself to various talas, it is referred to as "Thalamaligai". But lyrical beauty and poetic elegance alone do not make Arunagirinathar's compositions great. Thiruppugazh is a treatise on truthful and virtuous life. While the forms of composition are soul stirring, the contents are inspiring and worth contemplating upon. The song: "Madhiyal Vithagan Aki, Manadhal Uthaman Aki" shows how one could shape himself or herself as a full-fledged personality combining the qualities of head and heart. Another song explains how one could steer this life to its correct destination (Pakar Tharu Kuramagal Tharuvamai Vanithayum Irupudai Uravaru Perumale). Some of his songs are addressed to the Lord with a prayer to provide solace and salvation, while some others are addressed to fellow beings to come out of their world of illusion and seek the way to real and lasting happiness. The best path that leads to ultimate salvation and puts an end to this cycle of birth and death is one of knowledge, Gnana Marga. One who adopts this path is redeemed from this material world. At Thiruavinangudi, the saint composed the song: "Sivanar Manam Kulira, Upadesa Manthram Iru Sevi Meethilum pakar sei, Gurunatha" (Oh! Muruga, let the knowledge you imparted to the pleased Lord Siva be given to my ears too.) The song further seeks a removal of sufferings caused by ignorance and grant of bliss by getting enlightened. "Arul Gnana Inban Athu, Purivaye." Arunagirinathar believed that Bhakti Marga, the path of devotion, is equally compatible. (Bakthiyal Yam Unnai, Pala Kalum, Patriye Ma Thiruppugazh Paadi." "For long I have been singing your glory with devotion, Oh God, grant salvation to this life." He stressed the importance of nama Sangeerthanam in Kandar Anupoothi thus: "Paadum Paniye Paniyai Arulvai." (Grant me a life that I could devote entirely for singing your praise). Thiruppugazh is a book of treasure from which a Karma Yogi also can draw lessons on Dharmic life. There are prayers meant to fulfil the different aspirations of people. The song: "Viral Maran Aindhu Malar Vali Sindha" is ideal for removing the marriage obstacle, "Jegamayai" for the growth of baby and mother during pregnancy and "Irumalum Roga" for health. The song that will shower wealth and prosperity is "Charana Kamalalayathai Arai Nimisha." The "Ainkaranai Otha Manam" number gives a happy and harmonious life, "Sinathavar Mudikkum" combats miseries caused by foes and "Antarpathi Kudiyera" helps one to own a house. While the hymn "Nal En Seiyum" is a safeguard from adverse planetary influence, the song "Iravamal Piravamal" helps to get the blessings of guru or teacher. The list goes on endlessly. In short, the poet saw Lord Muruga in different roles, that of a handsome youth, an intellectual guide, a saviour, a physician and a friend. Arunagirinathar lived at a time when the differences between Saivism and Vaishnavism were almost receding. He believed that all forms are manifestations of one Supreme Being. He found as much joy in singing the glory of Vishnu or Narayana as that of Siva or Muruga. He visualised Muruga as admiring young Krishna's 'mischief' like stealing butter ("Navaneethamum Thirudi" from the song: "Sivanar Manam Kulira"). Besides, Arunagirinathar ended almost all his songs by addressing Muruga as "Perumal", the word normally used by Vaishnavites. The songs of Thiruppugazh, so rich in content and so universal in concept, can rightly be acclaimed as great. It was the learned Vallimalai Sri Sachidananda Swamigal (1870-1950) of Thiruchengodu, who initiated the movement of popularising Thiruppugazh. In his task he received the blessings of Sri Seshadri Swamigal and Sri Ramana Maharashi. He dedicated his entire life to this endeavour, compiling songs, setting them to music and conducting bhajans. 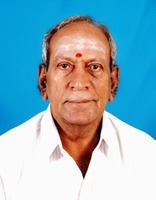 Judge T. M. Krishnaswamy Iyer of Madras carried the Thiruppugazh message to greater heights by his bhajans. Guruji A.S. Raghavan started a movement for expounding the cause of Thiruppugazh through songs. He has been providing an able leadership to a group of devotees called "Thiruppugazh Anbargal" spread in different parts of the country. Having selected 475 songs and setting them to music with different "Raga and Thaala," Thiruppugazh Anbargal has systematised a formal method of conducting the recital (Isai Vazhipadu). A Thiruppugazh recital is started with an invocation song on Lord Vigneswara, followed by an obeisance song to the teacher (guru) and conducted with songs of Aru Padai Veedu. It is continued with Kandar Anubhooti and hymns in praise of Vel, Mayil and Seval and concluded with the "Eru Mayil" number. The dedicated disciples of Guruji, Sri Raghavan have been conducting the recital in various centres by adhering to this method. Thanks to their total involvement and devotion, a Thiruppugazh wind has started blowing quietly across the country. One such city where the Thiruppugazh movement is making waves is Coimbatore. Classes are held at around 20 centres for about 300 anbars, while bhajans ("Isai Vazhipadu") are also conducted at different places. Every Saturday, the hall above Annapurneswari temple in R.S. Puram is almost packed to capacity. Here, lessons on these Tamil songs are given by N. V. Vaidyanathan of Kerala origin, a musician with that rare combination of skill and devotion. Arunagirinathar himself has set certain basic requirements to be fulfilled before one sets out to render a Thiruppugazh song. A true Thiruppugazh devotee should necessarily have a heart full of devotion, love and compassion, a mind devoid of any feelings of lust, ego or anger, and also capable of concentrating on and surrendering before God. Saint Arunagirinathar gave a new orientation to Tamil devotional literature. In contrast to Valluvar and Kambar who used pure literary Tamil ("Thooya Ilakkiya Thamizh") has copiously used Sanskrit terms. Because of his unique style of composition, his universal outlook and his masterly analysis of the complex nature of human relations and behaviour, the saint has been variously hailed as a giant among poets, a rare genius and an erudite scholar. Going by the lines of Thiruppugazh, one realises that literature and devotion have never been blended so harmoniously before.